Education has to stop pushing the same content at the same time in the same manner to all pupils regardless the readiness level, different learning styles or learning preferences (1). Many learning journeys turn out wrong, upsetting the child and parents. In the regular education in Flanders (biggest part of Belgium) one out of eight drops out of school without any diploma. This is huge. ‘School fatique’ is the main reason with 21 percent of the drop-outs. That’s one out of five. In the second place of the drop-outs comes ‘I’m not motivated to study’ with 11 percent. These numbers make me shiver. Where along the journey did we lose them? First of all I believe that the actual school system makes students drop out. Especially grouping kids and youngsters merely by their date of birth shouldn’t be the norm any longer. Don’t misunderstand me: peers are important along the journey. It’s just that every child is different by principle and treated like that in a family environment the school system dictates otherwise. The teacher is key by default (2). The journey should be one of admiration and astonishment for everything around. Personalised learning is the standard. There will be a time when the teacher will ask a student if he feels ready to take the test. This question says a lot. It expresses a common interest. The test is no longer a verdict like it is today. It is a means, another starting point. It should trigger the pupil positively not punish him. Learning platforms that provide data driven learning paths are the benchmark in the journey. Such a system provides more quality time for pupils and teacher. It opens up the door to get rid of the classic grouping system invented more than 100 years ago. For some learning sequences the pupil does not need a teacher. We’ve discovered in bingel (3) that pupils progressed by themselves engaging in lessons they didn’t took in their class yet. Remarkable and awesome. The learners’ journey will take place in a learning centre which is open 5 days a week. There the pupil can attend level classes, FAQ sessions, group discussions, visit private study quarters, meet friends … but he won’t be there the whole 5 days At home he can practice online what he learned. This distant learning is indispensable in the journey. It’s very accessible because the pupil can video call a teacher. It so much more than absorbing a video which is static and not interactive. Such video’s will be around for some time but they are so 2010. According to former Secretary of Education Richard Riley (US) the top 10 in-demand jobs in 2010 did not exist in 2004. How can we prepare our kids for the future? 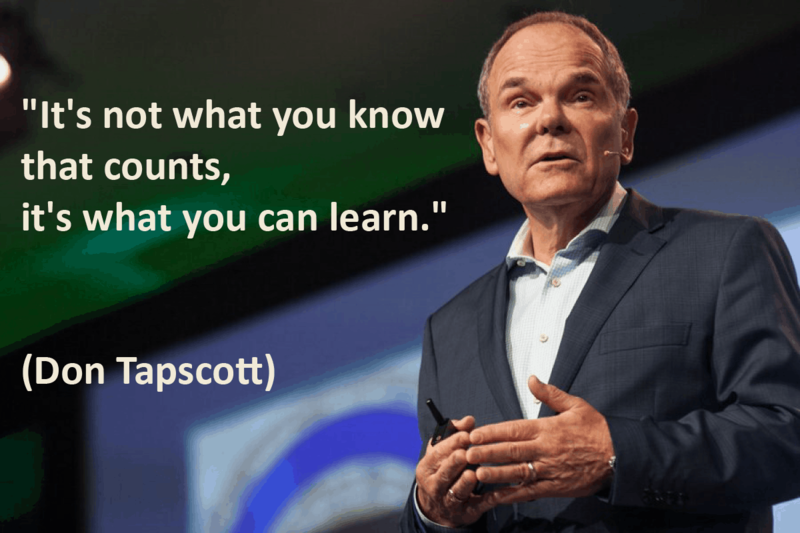 The answer is given by Don Tapscott. He says it all! So let’s make the journey worth while and let’s focus on the future of learning. The kids deserve it and we owe it to them. I’m doing some work for the SLLT about what personalisation means for Sanoma Learning. One of the big questions I have is how we achieve something like you describe in a world of traditional classrooms, teaching methods, curricula and national assessments. I hope to get chance to discuss some ideas with people from the OpCos later this year, so I look forward to talking with you. Thank you, Martin. Yes, please come over to talk about this. That would be great. Looking forward to meeting you again.